I printed in 3d printer the given files and there are 16 tracks in the palette. How do I reduce tension? I have the same issue in the past time. then i have mountet 8 tracks by every wheel and then it runs fine. Could you please share your modified wheels. Wow, really nice tutorial! It would be great if you could do the same with other modules. Thank you, that's a good idea. I will try to do so, but I don't have other modules for the moment. Can anyone tell me how I would be able to use 1-1800 mah 3.7v li-ion battery to power this project? i think the arduino needs at least 5v. My connections are correct, the motor shield works in different applications. But when I connect the 9v battery to the motor shield, the wheels don't move. include Wire.h // I have removed only for here the #, < and > while it is not a MD Document! The car is not moving! many many Thanks, this was realy helpful for me. Now it works fine. looks like the IR module has only one pair of LED and receiver? If the car goes off line, how does it know wheather it should turn left or right? I'm not an expert or i'd go into lots of detail, but usually there are two mounted, one on either side, to detect which direction you should go. I'm sure there are some helpful youtube videos. Hi, I have just realized that the tracks cause some friction and load the motors, even the motors are running free (around 100mA without tracks and 400mA with tracks under 6V supply). Do you also have similar results (that is the track connections are tight, squeaky and cause friction) with the tracks? Also due to unequal friction caused by left and right tracks, the robot does not go straight but slightly steering to one direction. Do you use some encoders or any other method to overcome the steering issue? Edit: I figured out that the steering issue is caused by speed difference of the motors, somehow even under no load, they have quite big rpm difference, when supplied with the same voltage, even though they are both 1:298 HP metal gearmotors. Hi, I am new to this, how do I attach the ultrasonic sensor to the robot without using a breadboard? Edit: I found a tutorial on how to do this. Can you please share this Tutorial, i have the same problem? Is it just me or the small thing supposed to hold the mechanical tracks together isn't in the folder ? I get an error, "WARNING: category 'Device' in library Motor Shield V2.0 is not valid. Setting to 'Uncategorized'. The code uploads and I've tried using a 9volt battery two 3.7volt lithium ion batteries in a series; and the motors still will not move. The motor shield LED comes ON but still no movement. I've even swapped motor shields in case it was defective and still no luck. I measured for voltage at the m1 and m2 terminals and I get 0 volts or either a very small amount of voltage. Also I'm not using a ultrasonic sensor or line sensor. If someone knows what might be wrong please let me know. Anyways the robot looks awesome! Great design! Hello i have the same issue, have you a solution? I am curious about using the 9V battery the instructions call for. The motors are 6v, if you use a 9v battery on the motor driver the motors are going to be getting 9v. Is anyone experiencing a problem with this? Would 4-AA batteries or 2-3.7V lipo batteries (like micro-drone batteries) in series be better? My local library has a 3D printer, but only allows jobs up to two hours. How long does this take to print? They have a Lulzbot Mini 3D printer using PLA. Great project. I did it myself, but I have a problem with wheel skating. I used a n20 engine with 200 rpm. Do you have any idea how to solve the problem? Hi! Congrats for this project. Hi and thanks! What do you mean? How to move robot? Whith app mobile? This looks like a great project, just starting to get into arduino and raspberry PI and this looks like a great starting project. I have ordered the parts and looking forward to introducing my kids to electronics/programming with it. But there does appear to be a closing bracket where it should be - anyone have any ideas? The code is just copied in, I haven't messed with it at all. It would be nice if this code was on github. I could fix it up and put it there but the source code doesn't have a license notice in it so I am unsure what the license is for the source code. The thing itself is licensed as "Creative Commons - Attribution - Non-Commercial - Share Alike ", but I am unsure if that includes the source code. Yeah, PDF isn't the best way to distribute source code, the problem is when you cut and paste some lines are getting combined with the comments. If you notice at last a couple of variables, some function calls, and some brackets are hiding in the comments. I cut/pasted and fixed it up. Attached. Hi! I just uploaded a sketch for ultrasonic navigation and Adafruit motor shield V2, it's called "SMARS_ultrasonic_demo_AFMS_V2"
I also have the same problem, Adafruit Motor Shieldv2 can't even rotate the motors. Does any one instruct how it should be used? How did you orient the prints for the wheels for no support? Thanks, my son couldn't be more excited to start printing and tinkering once the electronics get here. Great, hope you will have a great time during the construction of your SMARS! If any one needs it, I exported the source files to STP format, (what can be imported into many design tools, like Fusion 360, that is the one I use). How much bigger can it get without significant editing to the original files (how much can i zoom it straight up)? And then, what motor will keep up with the weight gain? What about battery power? Hello, can we use the analogical pin for US Sensor ? A0-5 on Motor shield ? Also, did you try to use a 3s LiPo battery (12,6v fully charged) to power it ? There is no regulation from motor shield ? I currently use a 2s lipo for Otto where servo are 5v powered. Hello, can we find a wiring diagram for IR sensor ? It's only simple if you know how. Awesome! Does anyone know if i can control it with one of those bluetooth/wifi controller (like a PS2 controller)? When i printing, under wheel not printing :( Should i use support? Can your SMARS robot follow a black line, if so with which sensor, and which piece in 3d. Votre robot SMARS peut-il suivre une ligne noire, si oui avec quelle capteur, et quelle piéce en 3d. I am very excited about this project with my daughter. I have printed almost everything. I just have a simple question. Can I NOT use the motor shield and connect the dc motor to the arduino UNO directly?? I did one arduino based rover before using 2 continuous servo 9g and I did not use any motor shield and is working fine. Just wondering if I can do away with the motor shield in the SMARS setup. I will be using the regular 9v battery. Hi, unfortunately with this motors you can't. They need something like 200mA and an arduino IO pin can give maximum 40mA. You can do it with the servos because they have s, +and -. SIGNAL (s) is only a control and doesn't require so much current. Learn how to use a motor shield can be really useful for a lot of projects, so I suggest to use one, the adafruit v1 is enough, it's cheap but allow you to control many motors without current problems. Thanks for your prompt reply. I will take your advice to learn more about the motor shield. Are you using the 9v battery configuration? Is the jumper connected? It gives no signals when you use only the 9v battery as power supply? Yea, just picked a few of different 9V batteries. What's interesting there is no effect if it's connected or not, it is near the power terminal l298. If not what other motors can I use? Hi, at the moment is not possible. An alternative to the suggested motors, are the 28bjy-48 stepper (but they are slow AF) or the sg90 micro servo motors (you have to cut them, modify for 360 rotation and you lose the space for the battery) so my tip is to chose the N20. All the future mods, will be based on this version of SMARS and the compatibility with alternative chassis will not be guarantee. I've been looking around for code on programming a Keyes IR remote to this, but have not seen anything about how to tell the motor what to do when certain keys are pressed.. Know where I can find a tutorial for this? А нет исходников для SolidWorks? The motors indicated are for 6V, will they be OK with the 9V supply? How is the ultrasonic sensor connected to the development board? what kind of wires should I buy? That guide is great. I see on his main photo that he has a black and red on off switch. Do you know I can order that? Можно использовать моторы на 3v 150RPM? Is there a mod out there for the housing for the slightly larger hy-SRF05 ultrasonic sensor? Hi, where can I find the model for the shovel? I am not quite sure how to connect the IR sensor. I figured out that the EN can be jumpered but I always get ~1020 to 1023 when GND and +5V are connected. It looks like it even works without GND or +5V connected as long as one is connected? Duh? No luck but it isn´t my day as it looks. and it doesn´t give me any values either. Changed even the arduino. Nothing. Got it working for some seconds Trigger on SER1 rightmost pin (10) and Echo on SERVO_2 rightmost pin (9). However the L2930 on the shield are pretty much crap. Get hot quick and obviously died because one motor stopped turning. I swapped them and same thing happened. I guess the L298N would do better. Are your tracks long enough? It was running "floating" on a block. No chains on the wheels no track to follow. So absolutely no load. I checked the sensor with my hand then. I have a ton of other motor drivers so I´ll try those instead. I don´t like the shield anyway as it blocks all the pins. Oh sorry for the mistake. Gotta find a way to use your version with the motor shield. I´ll give it a try without the motor shield. Yes I use the one you linked in the youtube video comments. The LED is always green. Does it work better with matte black marks or glossy? I am just curious because it doesn´t give any significant values. The "flickering" between 1016 and 1023 is probably not caused by the light because it also happens if I don´t change the position or the light. The motor shield is not the problem either. Hi, thanks for the very interesting Project. I have a problem with the mechanical track. Its to short. 16 limbs are too short and do not get these over the tires. 17 are too far. Does anyone have the problem too? Hi thanks for the project. This is my first Arduino build. 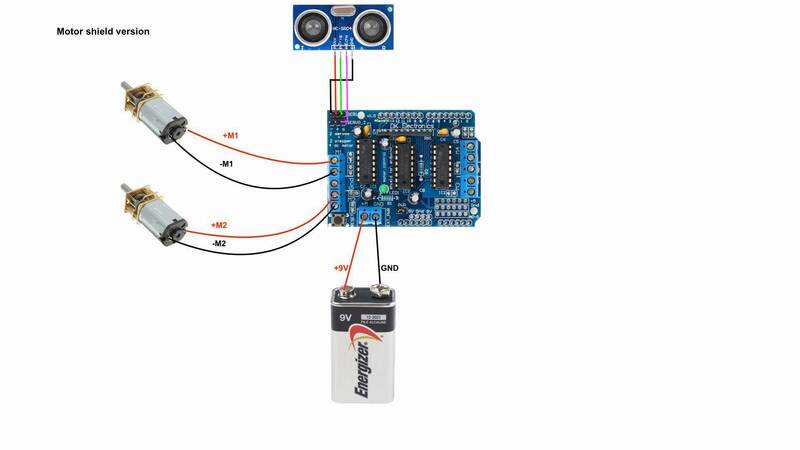 Can you show the specific wiring using the ultrasonic sensor and the Adafruit motor board? Do I need to solder the jumper wires from the sensor to the Uno board since the shield uses the pins? Is there an easier way? Thanks in advance. I'm using this great little robot to help my 6 year old get into robotics, and he is thrilled. I would also like to create one that works with a Raspberry Pi. Do you know if anyone has created a version for Raspberry Pi? If not I will try to create one and share if I'm successful. Q: On the mechanical tracks, why is the single hole on the 0.25mm smaller than the double holes? I can't fit 1.75mm filament there, only in the larger holes. Who would have the code for a L293D controller and a sonar ? Do you need supports for the chassis? Thank you! Hi ! First, really nice job ! I make right now my first arduino robot (Otto robot) and next i think i will use your SMARS ! it's look amazing ! Is it 2 channel sensor ? Hi and thanks, nice to hear that you like it! The sensor is this one: http://www.dx.com/p/4pin-ir-infrared-obstacle-avoidance-sensor-module-436279?Utm_rid=95945498&Utm_source=affiliate it's a simple ir sensor with analog and digital output, you can mount one, two or three of that depending on the project. thank you for your reply :) ! This guy has a video of how to do the filament pins on a different tracked robot. Perfect thank you! I'll be printing the SL model I think. Cheers! You're welcome! That's great, share a pic of your SMARS once it will be ready! Has that a meaning or are you just spamming on my page? Can I find a manual how to write a arduino program for the motor shield and a ultrasonic sensor? Do I need this Motor driver for the ultrasonic demo program, or is it also possible without it when I have the motor shield? Thanks for this nice project. My prints comes out very nice. The problem is that the hole for the motor shaft are not thight enough. Also the holes for the slave wheel and the tracks. The pieces of filamant comes out when the motor is running. I got this problem on all my 3d-printers (3). I am sure that the printers are calibrated. Do you have any tips please? Sorry for my english. Hi and thanks, nice to know that you liked it. For the master wheel problem there is this solution SMARS modular robot - modified wheels found on #Thingiverse https://www.thingiverse.com/thing:2732013. For the tracks you can melt the filament so it becomes like a rivet. I didn't understand what's exactly the problem with the slave wheels, do you have the chassis SL or the chassis S? Thanks for your reply. I will try your tips soon. The hole diameter of the slave wheel for the chassis S looks a little bit to great, but its okay, it works. I have printed both chassis. I like to use chassis SL first. Keep on your great work. Thanks again. So I'm thinking of remixing this to use a nodemcu with a motorshield (https://pt.aliexpress.com/item/NodeMCU-Development-Kit-NodeMCU-Motor-Shield-esp-wifi-esp8266-esp-12e-esp-12e-kit-diy-rc/32445659965.html). Other than the node, the shield, a 5V power source(to power the nodemcu instead of the 9V battery. NOTE: just saw that a 9V works if plugged to the VIN pin) what would I need to remix the smars? Note that by using nodemcu the control would be by wifi instead of bluetooth, so I'm aware that I would have to change the arduino code. Hi, you can make a simple adapter frame to adapt the Arduino's "rails" to the dimensions of that shield. Then for the power supply, if you don't want to use the 9v, you can mount the "3A battery mod" with a boost circuit to obtain 5 volts. Honestly I never worked with WiFi but I think that internet is full of help. The software part(bluetooth-wifi) i'll manage! It's the electrical part that I'm still learning! I've read on the front page that you have 2x45min lessons? Where can I see them? can't seem to find the link anywhere. I didn't, it was a tip. The lesson plan that I wrote is thought for a 90min lesson or 2 lessons of 45 min. I'm not a teacher and I don't know exactly if my lesson plan is suitable. Hi, the ultrasonic mount doesn't fit the HY-SRF05 model, which is very popular. Is there a way to modify the part to fit? I have both models of sensor. The board dimensions are the same, but they soldered the sensors just a little bit closer so it doesn't fit in the holder. Is there a way to adapt 28BYJ motor to the chassis? This geared motor is difficult to find. in your documentation, you talk about two different shields for the motors (the big blue one and the small red one). For the project with the IR sensor, is it okay if i use only the small red one ? а если ниже частота вращения, например 100 об/мин? Ive printed all the parts and very impressed with how its turned out thank you. However the tracks seem too tight causing to much friction for the motors to turn them. Whats the best way to free them up a bit? This is really outstanding. Thank you for doing this. I cant wait to build one! Thank you and your welcome. Join us in the Facebook group to be updated and share your ideas! Is your Idea to upload the cad files? Are there available somewere? Hi! Thanks, usually I don't spend much time in the documentation but this time I tried to do my best. The source files are available here on Thingiverse, they are in the "source_files.zip" folder. I designed all the parts with Cubify Design, the file format is odd and I don't know if other CAD softwares could open it. Let me know and have a nice Christmas! can you upload the pen holder & the shovel models please?? Hi, I just uploaded the shovel, unfortunately I can't upload the drawing tool because it's not a free model. Hi, I couldn't fine the shovel STL file!!! could you tell me where can I find it please?? Hello, did you find where you motor? Could you share any video, or how to program it? SMARS modular robot by tristomietitoredeituit is licensed under the Creative Commons - Attribution - Non-Commercial - Share Alike license.